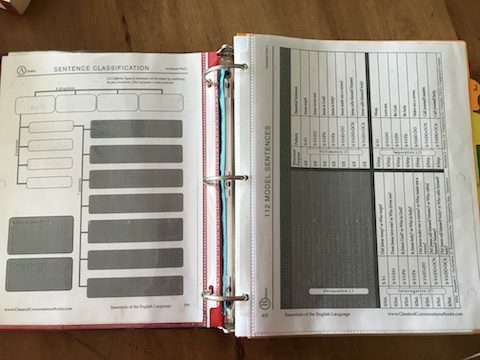 Last year, my oldest was in her third year of Essentials, and my second child was in his first year. While my daughter loved language, my son would have rather been building forts. 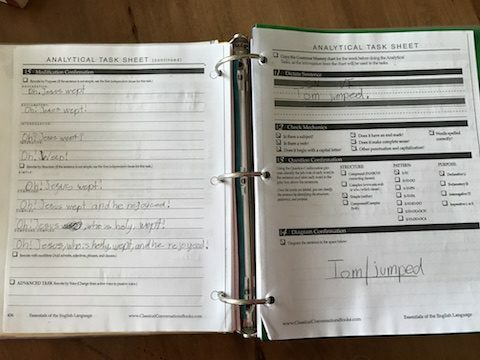 Since I had three kids younger than them – one of them a VERY active toddler, I wanted to have my older kids’ Essentials work all laid out for them before school began, so it would require a lot less guidance from me. So I am sharing the method we used last year, which is the same one we will use this year. 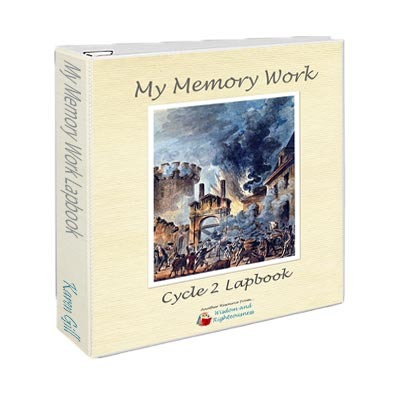 It made our school year with Essentials SO MUCH EASIER and effective! I am sure there are a lot of methods out there, and this is just the one that works for us! I will definitely be using this method for all of my kids going forward. 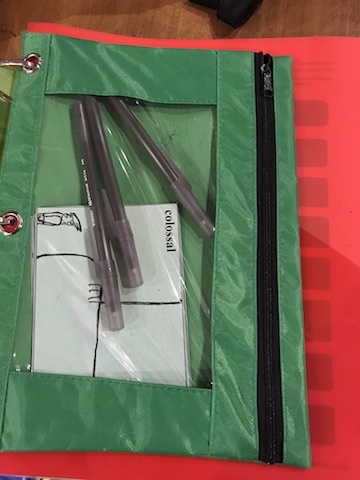 At the beginning of their binders, I included a Pencil pouch for their writing utensils, IEW vocab cards, dry erase markers, etc. That way everything was handy each day. Copy page 433 & 434 from the Essentials Guide, and place them back-to-back in a sheet protector. Put this page at the front of your binder, before week 1. Copy page 394 and put it in a page protector behind the page you just put in. 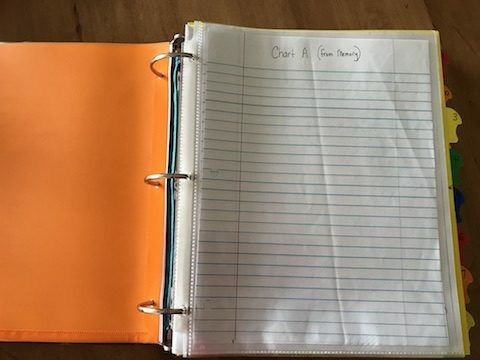 4-8 sheets of College-ruled paper (the number of sheets depends on the number of charts you want your student to be copying. 2 charts a day was our max) Paper with a reinforced edge is nice if you can find it. Last year I put these in page protectors so the kids could re-use them. This year, I will definitely put blank pages in them. That way I know that at the end of the week, all pages should be completed. Copies of any new charts introduced that week (Just as a quick reference. The first week it is introduced, I put a copy of the chart on one side of a page protector, and a blank chart for chart copying that week. After the first week, they use regular lined paper to re-create their chart from memory). First-year Essentials Students are going to be absorbing a lot, and so you want to focus on the major things. Page 18 of your Essentials Guide tells you when each new chart is introduced. For the first-year student, I would recommend only having your student practice copying charts A, C, & E until they are thoroughly mastered. If they get those down, then move on to F, H, I, & L. For second & third year students, you could follow along with page 18 of the EEL guide. 4 copies of the Analytical task Sheet (the student uses one per day. First year essentials students will spend most of the year on the front side of this page, and add tasks as they master the basis. Second and third year students can complete both sides.) The student can use the Weekly Sentences that you already copied in step number 2. 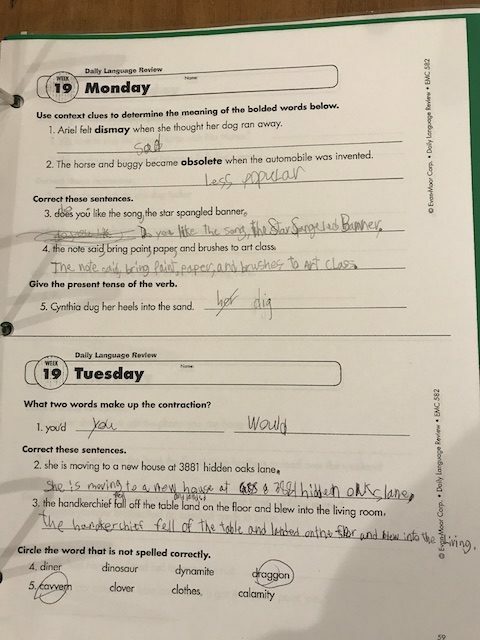 My kids picked a sentence from that week, and completed an analytical task sheet each day. My third year student liked to use those sentences, but change the verb and nouns to create variety. 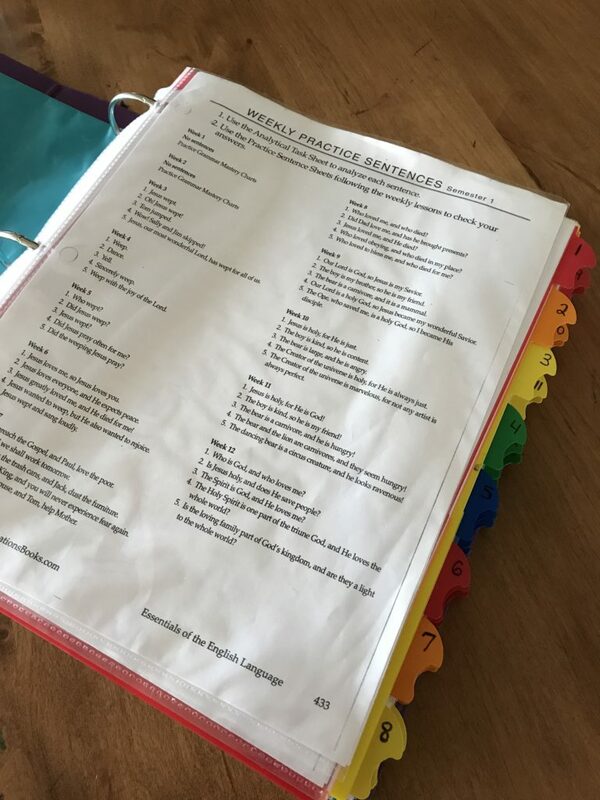 First year students will want to stick to the written sentences since those are worked out for you in the Essentials Guide if help is needed. 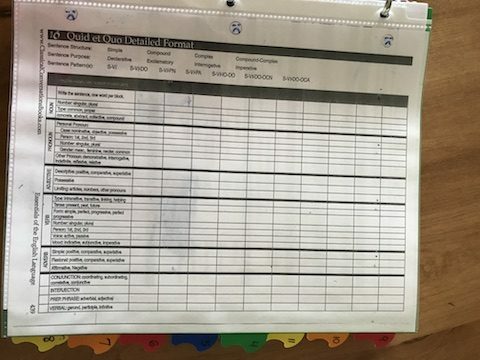 Blank Quid etQuo worksheet (beginning in week 3) – Last year I put this in a page protector. This year I will put separate pages so that I know they get completed each week. My Essentials student is a second year student this year, so I will have him do two of these a week – next year, I will have him do one a day. 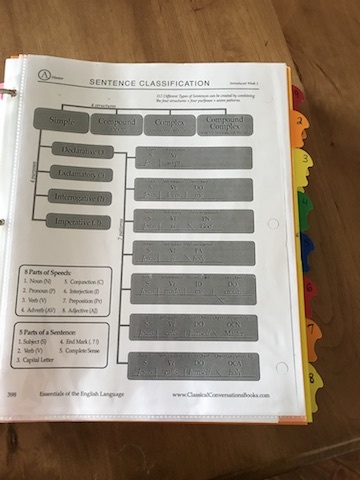 Evan Moor Daily Language Review (DLR) (for 1st year Essentials students) OR “Our Mother Tongue” (OMT) Worksheets (2nd-3rd year Essentials students – found on CC Connected, Essentials Tier – Weeks 1-12 are posted by HCASport, Weeks 13-24 are posted by cjahnke. You can also find them by typing in “omt” in the search field.). These items aren’t crucial. I appreciated some of the concepts that the DLR brought up, and I really loved giving additional work to my third-year essentials student reviewing the basics of each term from OMT in the order they are introduced in the Essentials Guide. I spread the DLR throughout the year, since you can easily have them do four assignments a week. 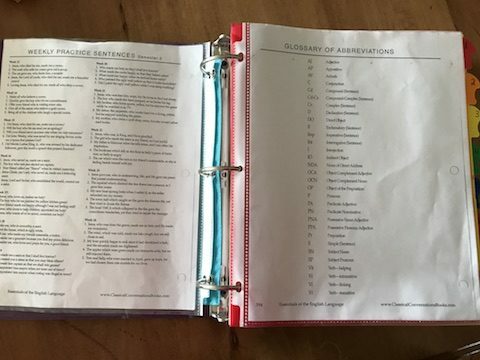 I divided the OMT resource according to the week it is introduced, which is already written on the page if you download the resource I mentioned from CC Connected. So this binder would include all of our Grammar work. It is so nice to have everything in one place, with students not having to ask me for sentences, ask me what charts to copy for the week, look around for separate resources, etc. It is just open-and-go, substantially reducing the amount of input needed from me during the year. For IEW, we just use a blank notebook to write our Key Word Outlines. One thing I found helpful for my son in his first year was for him to use the iPad to type his papers. There is a free Microsoft Word app, and he can just “speak” the paper so it will type it for him. My kids have other copyworb that we use to work on penmanship, and I wanted him to just be able to focus on the creative process of writing. As a very active boy, if he had to hold the pencil for a long time, AND spell his words right, AND spell neatly, the result would have been very basic, short papers so he could avoid all of that. I wanted him to write well, and work on those other items outside of his writing skills. For my daughter’s first year, she dictated it to me and I wrote it. But now with four in school, the app for speaking it was definitely a blessing – allowing him to do quite a bit more independently. When he finished, he would print his paper and correct it as well as he could, and then we would sit down together for the final edit and to make sure all of his components were included. This worked well for our busy family. I won’t let him use it every year, but I think this app would be handy for first year Essentials students and their parents, allowing the student and parent to focus more on the style and structure elements being taught in IEW. So there you have it! 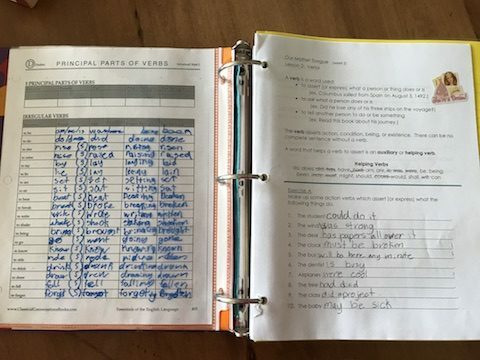 Nothing too spectacular to the basic eye, but from the perspective of using it last year, it made “Did you do your Essentials Grammar work?” an easy answer! I didn’t have to remember to check charts, tasks, and QetQ. It was all in one resource they couldn’t overlook. We definitely accomplished more than any other years, with less management on my part. Hope this helps you too! Thank you- this looks great. Is this something they take to class with them or just for home? Wow!!! Great ideas for a smooth year! Thank you!!! This is very helpful! I am a first time E mom (but I’ve sat through it for 2 years as a silent observer, as I am the F/E Director). I will definitely incorporate these ideas for my would-rather-be-building-forts reluctant learner! Thank you! This looks doable! 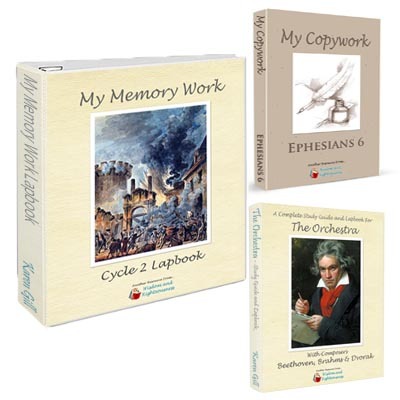 We’ve entered our first year of Essentials! Pretty excited about this binder! Hi there, I am a first year Essentials mom and tutor. I love this idea! I would love to implement this in my homeschool as well. I am a little confused on the page numbers you specify to print out, I purchased the current edition of the Essentials Guide and when I turned to those pages they did not look the same as the ones in the pictures you so graciously provided. I was wondering if you might be able to provide some clarification on this for me? I looked all through CCC Essentials tier for those extra Mother Tongue sheets and couldn’t find them. Have they been taken down?? Who uploaded them? Thanks! Could you give me more info on the app you use for voice to text? 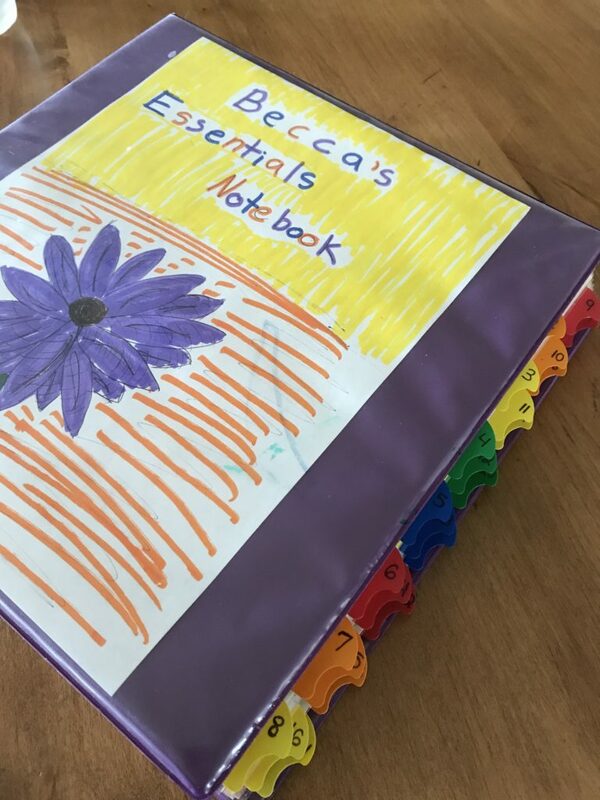 I love everything about this set up and agree that maybe using that app would help encourage the other aspects of learning to write……..
Hi Rebecca! Most tablets & Phones can download the “Microsoft Word” app for free. Then just hit your microphone on the keyboard and it will type for you! Love how organized this is and allows for independence. This might be too long of a question to answer, but I was curious what your assessment routine is? Do you assess their work as they do it, throughout the day, all together, or a different way? This is only my 2nd year of homeschooling and I started later. I’m finally getting the planning part tweaked but the assessment piece is still tricky. 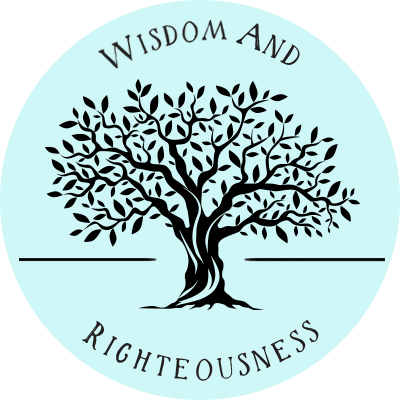 Asking anyone I can to glean some wisdom and ideas. 🙂 Thanks for sharing this! I love this!! I saved it awhile ago and I’m just now getting around to reading it…wish I’d read sooner as it would have saved me some time with my kids! Thank you for sharing this!